The Bureau of Economic Analysis (BEA) reported today that gross domestic product (GDP)—the widest measure of overall economic activity—grew at a 2.8 percent (annualized) rate in the third quarter of 2013. This was a slight increase relative to the second quarter’s 2.5 percent growth rate. However, there is little reason to celebrate today’s GDP numbers. For one, they remain disappointingly weak for an economy with so much productive slack. 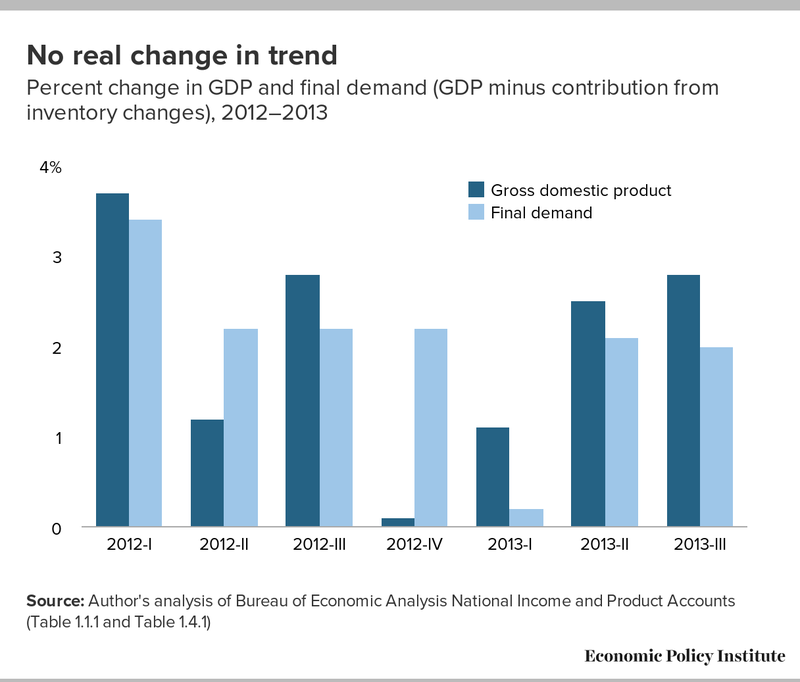 Further, growth in final demand—GDP stripped of the contribution of volatile inventory investments—grew at just a 2.0 percent rate in the third quarter. This arguably better indicator of underlying economic strength indicates that growth in the second quarter is essentially on the same disappointing trend that has characterized most of the recovery phase since the official end of the Great Recession. Additional evidence that third quarter growth was insufficient to soak up the economy’s productive slack is the continuing very low rates of core inflation measures. All in all, this is a status quo GDP report, and it clearly remains the case that the economy needs further support from both fiscal and monetary policy to generate growth sufficient to spur real improvement in the U.S. labor market. A small uptick in the personal savings rate led personal consumption expenditures (PCE) to make their lowest contribution to the quarter’s growth rate (1.0 percentage points) since the second quarter of 2011. Construction investments—both residential and business—contributed encouragingly to growth in the quarter, boosting the overall growth rate by 0.3 and 0.4 percentage points, respectively. Residential investment has been a source of strength in the economy for more than two years now. However, it is unlikely to increase its overall contribution to growth rates in coming quarters, so a substantial uptick in growth will need to come from other sectors. Changes in private inventories contributed 0.8 percentage points to the overall growth number for the quarter. Because this component of GDP is so volatile from quarter-to-quarter, however, many analysts instead look at GDP growth stripped of its contributions. As noted previously, this measure (often referred to as “final demand”) shows that the third quarter’s numbers show no particularly large increase relative to trends in the past two years (see Figure A). Trade flows boosted growth by 0.3 percentage points in the third quarter, with growth in exports exceeding growth in imports. While modest, this positive contribution is welcome, as it follows six straight months of trade flows dragging on growth. State and local government expenditures contributed 0.17 percentage points to growth this quarter, the largest positive contribution since 2009 (a contribution aided by federal policy support from the American Recovery and Reinvestment Act). This also marks the second straight quarter of positive contributions from the state and local sector. This is the first time this has happened since the official recovery began in the second quarter of 2009. As welcome as the positive contribution from state and local government spending was, it was nearly entirely neutralized by the 0.14 percentage-point drag on growth stemming from federal government spending, marking the fourth straight negative contribution made by federal government spending. In short, austerity at the state and local levels seems to be abating only as it tightens at the federal level. Finally, a key price index tracked by policymakers to assess underlying trends in price growth (and by implication, the degree of productive slack in the economy) continues to show extraordinarily low rates of inflation. The “market-based, core” price index for PCE grew just 1.1 percent compared with the same quarter a year ago. This index saw identically weak growth in the previous quarter, and has been showing declining inflation pressures since at least the beginning of 2012. Tomorrow the employment and unemployment data for the month of October will be released. Today’s GDP report and tomorrow’s jobs report should be used by policymakers to assess the degree of policy support the economy needs. The message of today’s GDP report is clear: There was no uptick in growth even before this fall’s fiscal dramas, and the economy remains weak with large amounts of slack. Further, there is little reason to think that this slack will be taken up absent increased policy support. At a minimum, today’s report should end any talk of an imminent end to Federal Reserve support to the economy (i.e., it should end any talk of “tapering”)—and in a rational policy world, it would spur talk of undertaking more fiscal stimulus to aid recovery.